Hi, everyone! 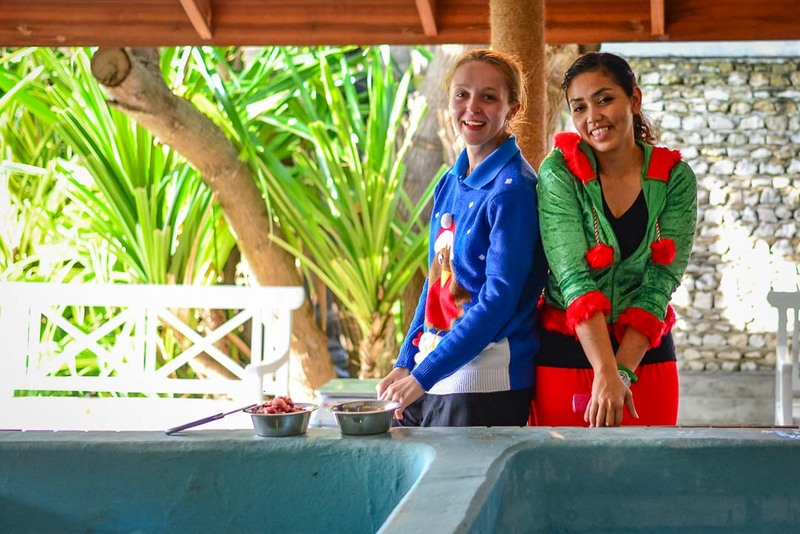 My name is Emily, and I am the new Seamarc intern here at Four Seasons Resort Kuda Huraa. I will be working here until March, so I look forward to keeping you updated on all my adventures! I graduated in Marine Biology from Bangor University (Wales) in July 2015. I thoroughly enjoyed my time there, though could not wait to venture into the real world and begin working … and what a place to start … in the Maldives! My first month has flown by, and I am thoroughly enjoying every minute of my time here. 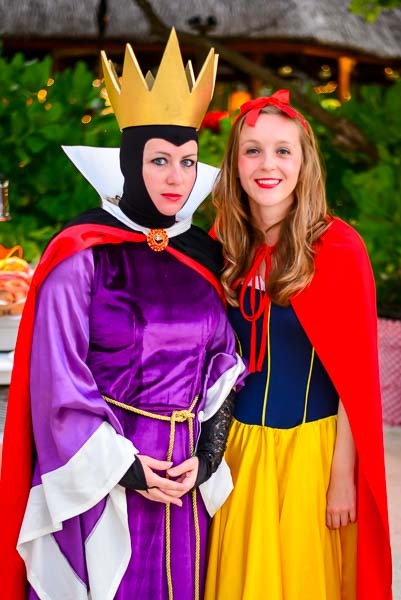 The festive period was incredibly manic in terms of work and themed evening events with guests, but allowed me to settle in quickly and learn names and faces around the resort. To kick start my internship, I got to witness Jamie (turtle biologist) release one of our green sea turtles on 23 December. Given the name ‘Lavender Peace’ by one of our younger guests, she swam straight into the ocean with a big crowd watching. She had reached a size whereby it is more likely she would survive in the wild against predators than as a new hatchling and so it was time for her to leave the safety of our turtle pools and begin an exciting life, grazing on seagrass out in the Indian Ocean. Christmas Eve brought a fun night of guest-related festivities, and I was chosen to play “Snow White”, with my colleague Kim as the “Evil Queen”. We mingled and took photos and it was a great chance to get to know many of the wonderful Kuda Huraa staff. I was recognised by almost everyone the next day at lunch, so for a short while I enjoyed life as an island celebrity! Christmas day this year was truly one-of-a-kind! 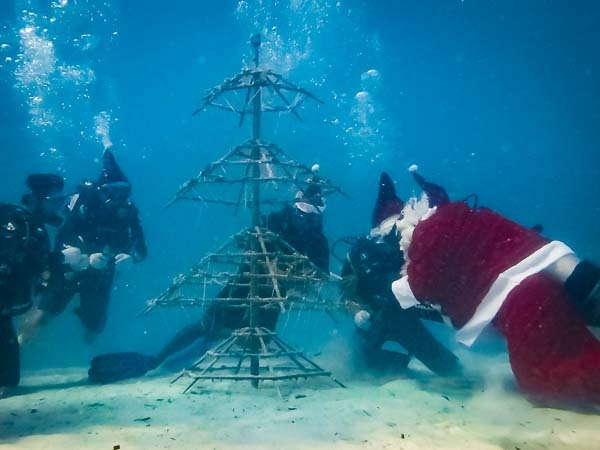 Not only did I flaunt my Christmas jumper around the turtle pools, I also got to dive with Santa Claus and help him transplant the coral fragments I had collected the previous day onto our Christmas tree frame (yes, there’s a first time for everything!) With lots of helping hands from staff and guests, we managed to get all the fragments onto the frame and by the end it was looking more Christmas tree-like! Over the next few months the fragments should grow and in 3 years’ time the frame should be covered with thriving, healthy coral colonies. Re-transplantation of healthy corals from donor colonies on the house reef onto the coral frames. Frame monitoring – photographing existing and new frames and uploading them to the database. 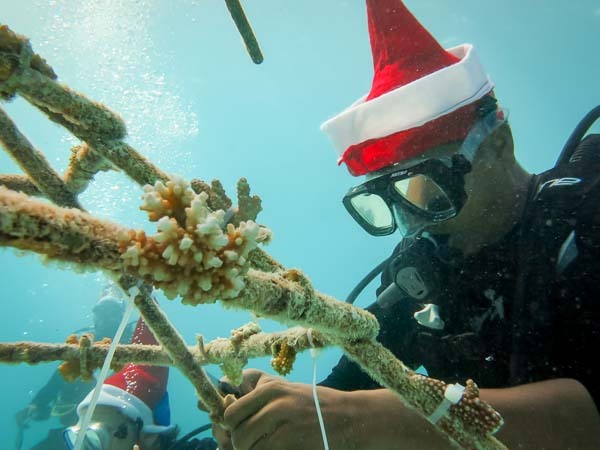 Build-a-reef project – whereby guests can sponsor a coral frame and attach the fragments themselves. I have also become acquainted with other aspects of work within the marine biology team at Kuda Huraa. 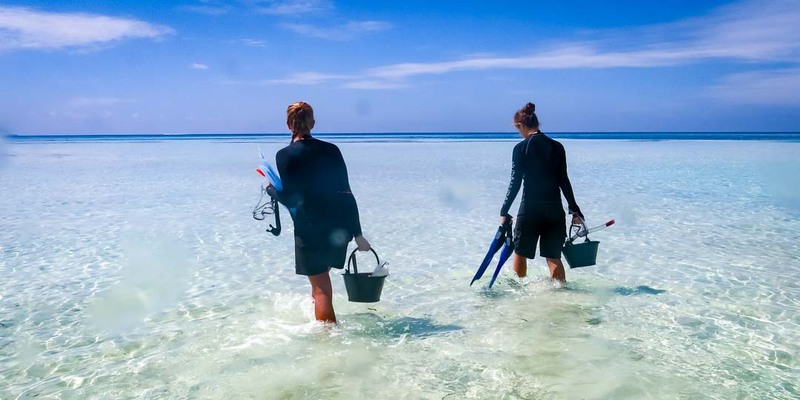 One of these is taking part in and leading the various guided excursions with guests, such as the dolphin cruise, adventure snorkel and shark and turtle safaris. You can see some breathtaking marine life here in the Maldives, and every time I’m in the water I feel constantly in awe of my surroundings. On my first shark safari, we saw about 20 blacktip reef sharks as well as two eagle rays and a 1.5m bumphead parrotfish! The dolphin cruises by contrast are usually quite relaxing at the end of a long day. 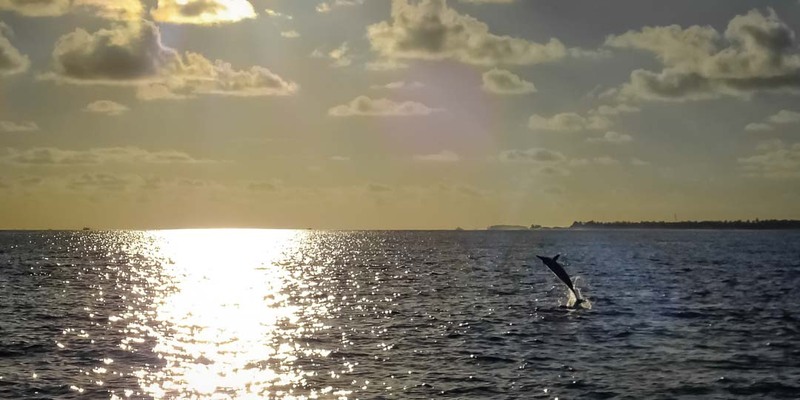 Following an informational talk, the cruise departs and within 20 minutes it is likely we have encountered a pod of spinner dolphins, putting on a fabulous performance of acrobatic twists and twirls. Various theories have been suggested as to why they do this, such as that they do it for communication purposes, to remove parasites or even just for fun. Nobody knows the true reason yet! Even whilst monitoring coral frames in the channel I have seen some incredible things. A blacktip reef shark passed by whilst I was photographing one of the frames, and luckily for me that is becoming a normal reality of day-to-day work here. The channel in particular has some wonderful marine life to offer as a result of the work that has gone into the coral frames there. The frames create an ideal habitat within which fish can live, hide and farm algae. My eyes are constantly met with the vibrant colours of wrasse, parrotfish, butterflyfish and damselfish. 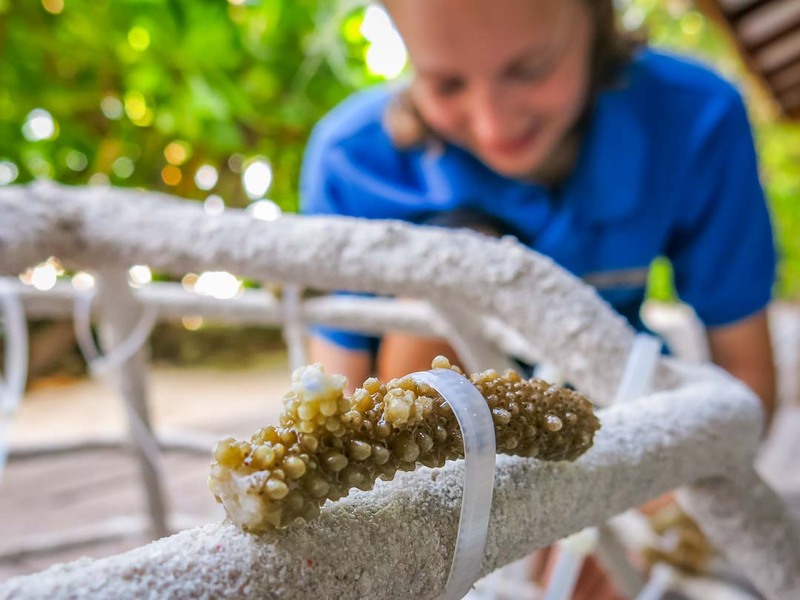 Along with my monitoring duties I have also been helping maintain all of our coral frame sites by removing algae, dead coral fragments and any coral predators, such as the marine Drupella snail and the Crown-of-Thorns starfish (Acanthaster planci). Both coral predators and algal overgrowth are a big issue for corals. Predators feed on coral tissues and algae can smother the coral, blocking out the sunlight, and therefore the zooxanthellae living within the coral tissues cannot photosynthesise and produce the foods upon which the coral relies. In addition to my work as an intern, I am also completing a research project to broaden my experiences and write a scientific paper with the view to submitting for publication. My project aim is to establish the growth rates of different sized fragments of a coral species called Acropora digitifera in order to determine the size of fragment that will best grow on our coral frames with a higher chance of survival. My hypothesis is that “coral fragments of a smaller size grow rapidly, until reaching a ‘grow-out phase’ whereby their growth rates begin to slow”. Despite having a faster initial growth rate, smaller sized fragments do suffer higher mortality rates so I will be very interested to see the outcome of my experiments as it could help with size-selection of the fragments at Kuda Huraa, and has wider potential for the selection of fragments for propagation at other resorts.